The Giant Trevally is similar in shape and appearance to a number of other large jacks and trevallies, having a large profile secondary to its muscular compressed oval body. GT’s are normally a silvery color with occasional dark spots although males may be black once they mature. The fish grows relatively fast, reaching sexual maturity with a length of approximately 60 cm at three years of age. With a documented maximum length of greater than 5.5 feet (~2 meters) and a weight of 175 lbs. (80kg), fish this big (or even close to this size) are extremely rare, with the species only occasionally seen at lengths greater than 3 feet (~0.8 meters). The Hawaiian Islands seem to have the largest fish, so if you are aiming for a trophy….Aloha, GTs over 100 lbs. (45 kg) are there. That being said Hawaii does not offer consistent chances for GT. They are sporadic on the flats and seen by guides randomly. They are rarely the primary target but the local guides always have a 12 wteight ready in case one comes into the flats. You most consistent (and realistic) chances to catch a GT on the fly is Kiritimati (Christmas Island) or the Seychelles. Only three GTs over 100 lbs. (45 kg) from non-Hawaiian destinations have been reported to the IGFA, so plan on 50 lbs. (~22 kg) or less to keep your expectations realistic. The Giant Trevally is distributed throughout the tropical waters of the Indo-Pacific. They range southward from South America in the west to Hawaii in the east, as far north as Japan and southern Australia. They range along the coasts of three continents and many hundreds of smaller islands and archipelagos in the Indian Ocean. This species easternmost range is the coast of continental Africa, being distributed from the southern tip of South Africa north along the east African coastline to the Red Sea and Persian Gulf. Its range extends eastward along the Asian coastline and has been recorded from Malaysia to Viet Nam, but not China. The southernmost record from the west coast of Australia comes from Rottnest Island not far offshore from Perth, Australia. The Giant Trevally is abundant in the central Indo-Pacific region, found throughout all the archipelagos and offshore islands including Indonesia, Philippines and Soloman Islands. Elsewhere in the Indian Ocean, the species has been recorded from hundreds of small island groups, including the Maldives, Seychelles, Madagascar and the Cocos (Keeling) Islands. GT’s inhabit a wide range of ocean environments as well as some non-marine environments. They usually start as juveniles in the safety of estuaries, shallow bays and lagoons, as most species do. These juveniles are also well known to live in waters of very low salinity such as coastal lakes and upper reaches of rivers. They tend to prefer brackish waters similar to baby Tarpon and Jack Crevalles. GT’s move to deeper reefs, offshore atolls, large embayment’s, bombora or drop-off channels as they become adults and realize their speed and power. Strong currents are usually present where these deep water environments exist so they usually don’t venture away from the estuaries and other safe areas until they are mature adults. The Giant Trevally is a solitary fish and once it reaches sexual maturity will only school for the purposes of reproduction and more rarely for feeding. They will venture onto flats, headlands and shallow water to hunt food. GT’s can also be found along the reefs edge and points where large pounding swells crash and stir up food which creates an ideal environment to hunt. Independent adult GT’s are also very territorial and are known to range back and forth along a home base which span as far as 9km. In the Hawaiian Islands, this home base is commonly seen. GT do not normally move between small circular reef islands but have a specific core hunting ground where they spend their time. Within these core areas, the fish are most active at dawn and dusk and prefer moving or shifting location near sunrise or sunset, at the peak of activity of baitfish movement. Hunting appears to occur at different times of the day in different areas of its range; off South Africa it is most active during the day, while around Hong Kong, it is nocturnal in its habits. GT’s predominantly take various baitfish as prey, although in some places, crustaceans, squid, octopus, clams, Mantis Shrimp and urchins make up a considerable part of their diet. Their eating habits have been determined in several countries and habitats and generally vary slightly by location and age. In some larger Giant Trevally, turtles and dolphins were reported being found within their stomach contents. This species is not unlike other flats hunters and have similar strategies to Bonefish and Permit. They will sometimes follow rays, Monk Seals or even large Reef Sharks and patiently wait to ambush their prey. This is quite bold when you consider the Reef Sharks are the only natural predator of the GT besides humans. In Hawaii, the species has a predominantly fish-based diet, with some crustaceans, including lobsters, squid and octopus. Younger fish inside Kaneohe Bay, Hawaii (north of Honolulu) are the only population of GT’s that prefer crustaceans over fish; Mantis Shrimp, crabs and other shrimp were the most common prey with fish a secondary food source for this group. Off Africa, the diet is similar, consisting mostly of fish including eels, some squid, octopus, Mantis Shrimp, lobster and other crustaceans. Fish of the estuaries in both Hawaii and Australia eat mostly fish along with crustaceans (such as prawns) and they are known to take more novel prey like spiders and insects. Giant Trevally’s feeding strategy may include hunting in a school which can increase efficiency but is not necessary for their individual survival. When a school is formed, one GT will take a leading position, with others trailing behind it. It’s just like fishing for bonefish, drop your fly in front of the school and strip it furiously to create competition. Some of the CT will seize the opportunity and act independently breaking from the pack to chase a fly. Most of the time, you will be chasing solitary GT’s on the flats. They are not difficult to locate since they aren’t quiet as they are pushing a lot of water. Solitary hunters have an advantage over pack hunters when you throw a fly at them because they are the only hunter there to attack. They will aggressively assault your fly and you will know that there is a GT at the end of your line. Some larger and bolder GT have been seen eating a lobster head first while it’s in a defensive stance. So you can image what they would do to a fleeing fly. The name of the game is creating the illusion of distress. If you cast a fly into the range of a GT, strip it effectively making lots of noise thus creating the impression that it is a desperate bait fish fleeing for its life, you will probably be successful. They are there to eat, so unless you do something to spook them (which frankly is not as easy to do as you would think), you should be able to entice one to attack. That being said, they aren’t injudicious so it might take some convincing for them to come on to the flat which is why many anglers will just chum for them. Once hooked it is absolutely essential to high stick (which is holding your fly rod over your head to help the line and leader avoid coral and other oceanic obstacles) as you have just infuriated one tough fish. The run of a GT is not like the run of a bonefish. They go in a zigzag motion and frequently turn around to come straight toward you which is pretty much the opposite of the blistering straight line sprint of the bonefish. Giant Trevally will do whatever it takes to get off the line except jump. Be aware that they know their domain and probably have enough familiarity with the landscape to use it to their advantage. While fishing for GT, one angler covertly admitted that he hoped for a smaller fish (under 30 lbs.) so that he might stand a chance of keeping both arms and maybe even landing it. This is a serious fish. Anytime you can catch a 30 lb. fish in 2 feet (18 cm) of water, it must be a powerful and very fast fish. Don’t misunderstand; both Bonefish and Tarpon are incredibly strong, tough fish. They are difficult to control while running and very trying to land as well. That being said, the GT is no doubt the strongest flats fish on the planet. If you get to fish for and land it, reminisce and treasure the experience. Keep in mind, there are so many anglers who have tried but did not succeed. It’s a difficult species on many levels. Flies that are commonly used are baitfish imitators, but our friends in Australia really like poppers. Depending on size of fish you can tie them on hooks from a 1-0 to a 5-0. 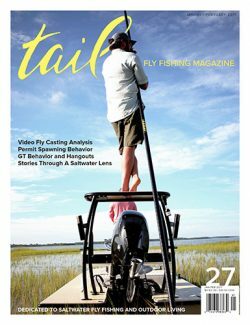 Search our HD Video Fly Tying Library for specific flies and fly tying videos Use our Destination Specific Fishing Calendars & World Map to help plan your trip. Line & leader information is also found in the destination pages of the World Map.